Found in rain forests, mountains, and lowlands of Australia, Papua New Guinea, and Indonesia, tree kangaroos have adapted to the arboreal life. The term 'Dendrolagus', originated from the Greek word: 'dendron' meaning 'tree' and 'lagos' meaning 'hare'. The word 'hare' was used by German naturalist Dr. Salomon Müller in 1842, to describe the game-like properties of the tree kangaroo meat. The various species of tree kangaroos inhabit the lowland rain forests of Australia, Papua New Guinea, Umboi, New Britain, West Papua, north-east Queensland, and some parts of Indonesia. On the other hand, some species of these canopy-dwelling macropods live in mountainous rain forests at altitudes up to 11,000 feet. 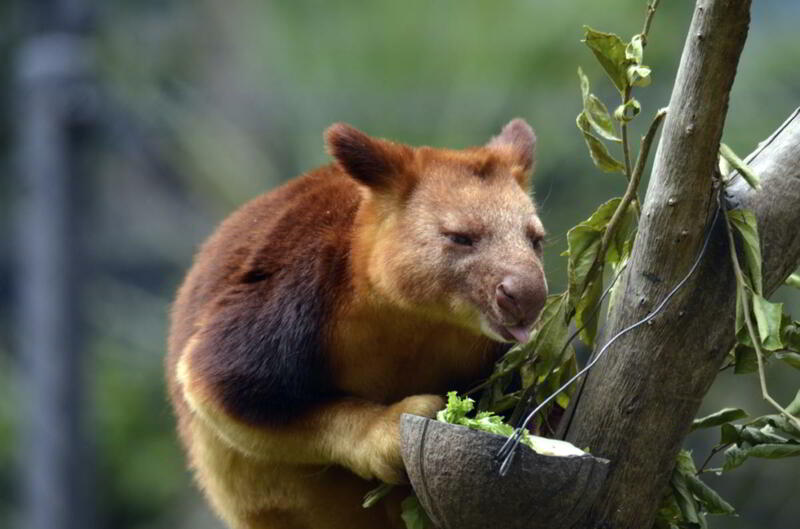 The tree kangaroo is an arboreal mammal and marsupial, which carries its underdeveloped young one in its pouch (marsupium). Following is the scientific classification for these animals and some more fascinating and fun facts. Each species varies in color, pelage (fur), and size. 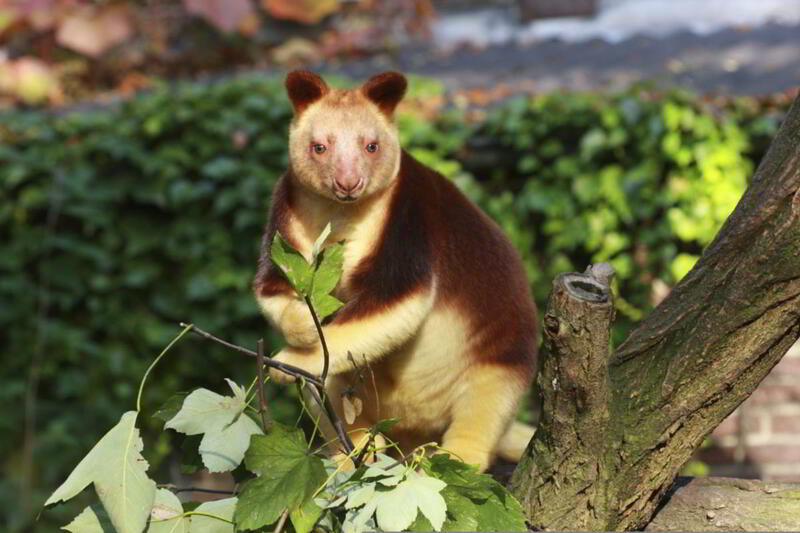 ✦ Tree kangaroos are slow and clumsy, and tend to walk awkwardly when on the ground. Since their tails are heavy, they tend to hop and walk with their tails up while on the ground. However, they are amazingly agile and fast on trees. ✦ These macropods have shorter and wider feet with long claws, which allow them to move faster on trees. They have big hind legs and small forelimbs, which makes climbing easy for them. ✦ The tree kangaroo has very sharp, curved, and large claws that aid in gripping tree barks while climbing and staying put. The hands have individual fingers that move independently which provide greater dexterity and grip. ✦ As compared to other macropods, tree kangaroos are the only ones that are able to move their hind limbs independently while walking, instead of moving them in the typical synchronous manner. ✦ The length of the tail is equal to the length of the body. They also have the ability to jump from one tree to another and their long tail provides great support and balance while moving. ✦ These kangaroos have rubbery soles that help them climb trees swiftly. ✦ These animals are excellent leapers and can jump up to 9m (29 feet) from tree to tree. They can even jump from 18m (60 feet) in order to safely land on the ground. ✦ Tree kangaroos are Australia's largest arboreal animals. ✦ An adult male and female weighs approximately around 15-30 pounds. ✦ The average life span of these animals can extend to 20 years in captivity. ✦ Tree kangaroos have small teeth which is used for feeding on leaves, flowers, fruits, tree bark, eggs, small birds, ferns, sap, and grass shoots. ✦ The pelage of tree kangaroos grows in whorls that helps in shedding rainwater from the fur. In some tree kangaroo species, these hair whorls grow from the neck onto the head. Whereas, in other species, whorls grow on the back, shoulders, or the tail base. ✦ These macropods lick themselves to keep cool during hot whether. ✦ Tree kangaroos are predominantly solitary animals that come together for the sole purpose of mating. ✦ Female tree kangaroos attain sexual maturity by the time they are 2 1/2 years of age, whereas, males mature at 4.6 years. ✦ There is no specific mating season for these animals. 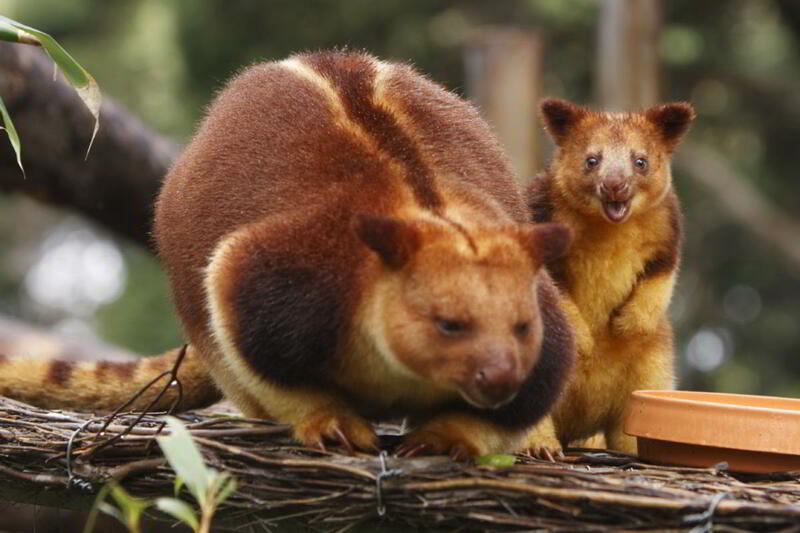 ✦ A female tree kangaroo is able to give birth to only one joey (baby kangaroo) per year. ✦ Male tree kangaroos are polygamous and can mate with several females within their home range. While females and males establish their homes independently and away from one another, the home of a male tree kangaroo is always situated in proximity to several female settlements. ✦ That being said, male tree kangaroos do not establish any harems and prefer living in isolation. ✦ The gestation period lasts for 44 days after which, the female gives birth to an undeveloped joey. The newborn joey is almost fetus-like and makes its way by crawling up to its mother's pouch and attaches itself to a teat for feeding. ✦ The joey stays in the pouch until it develops completely. The pouch life for a joey is approximately 9-10 months, however, the young kangaroo continues to feed on its mother's milk for the next 3-4 months. ✦ The young one stays with its mother until its approximately 18 months old and strong enough to look after itself in the wild. Why are Tree Kangaroos Under Threat? ✦ Tree kangaroos have been listed as 'Critically Endangered' by, The International Union for Conservation of Nature (IUCN). This listing entails that tree kangaroos are at the risk of imminent extinction. ✦ Among the many tree kangaroo species that are threatened, the species that are critically endangered are, Wondiwoi tree-kangaroo and Golden-mantled tree-kangaroo. Apart from the Lumholtz's tree-kangaroo, The lowland tree-kangaroo, and Bennett's tree-kangaroo, all the other species have been listed as either endangered or vulnerable by the IUCN. 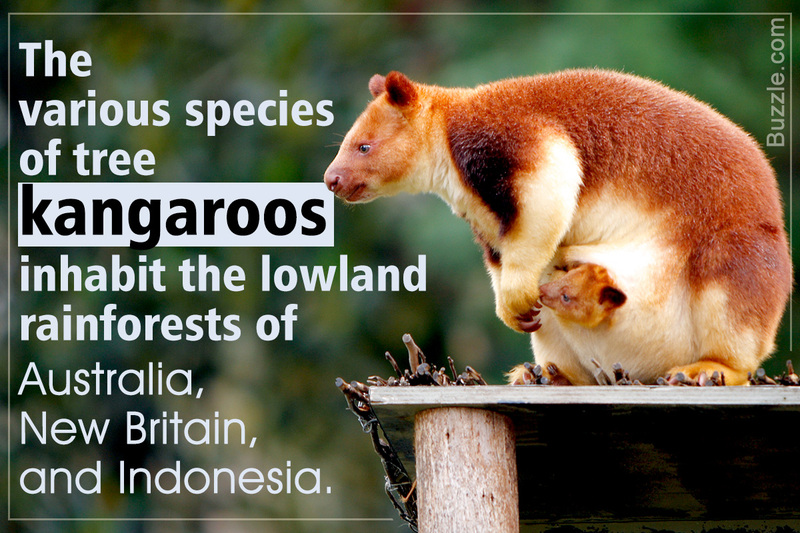 ✦ Hunting by humans and habitat loss has resulted in the ongoing decline among the species of tree kangaroos. A large number of these animals are run over by vehicles, killed by dogs, or losing their habitat because of deforestation, logging, human encroachment, farming, setting up of factories, roads etc. ✦ These animals continue to be poached for their meat and fur by the indigenous communities. Certain conservation programs are working on safeguarding these species and protecting their dwindling population. How is a Wallaby Different from a Kangaroo?